Day of the Dead Celebration, Movie at the Lighthouse & Street Dance! Lighthouse info updated, see below. 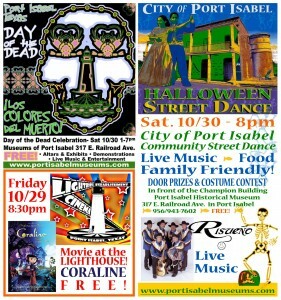 Port Isabel has big plans for the Halloween and Day of the Dead Weekend! Beginning at 8:30 p.m. on Friday, October 29th, the Lighthouse Establishment Cinema will be hosting the last show of the season featuring \”Coraline\”. Free, family fun at the Port Isabel Lighthouse! Concessions are available. Then join us for the City of Port Isabel HALLOWEEN STREET DANCE! Beginning at 8:00 p.m., Risueno will provide live music until 11:00 p.m. Vendors will offer all kinds of great food, there will be Door Prizes and a Costume Contest! LOCATION: Museums of Port Isabel, 317 E. Railroad Ave., Port Isabel. 956/943-7602. Free admission to the Museums throughout the day. Museums hours will be extended until 6:00 p.m. The Lighthouse will be closed until further notice as repairs are made to some of the steps. 1 Que muestra un gesto de risa en el semblante: entró risueño y le preguntamos por qué estaba tan contento. 4 Que es favorable o prometedor: parecía que el porvenir sería muy risueño. Risueño started 12 yrs ago in Brownsville tx. Some of the music performed by Risueño is original lyrics together with plenty of cover songs by other major artists but with a risueño style. The Style of music Risueño performs is targeted towards a family atmosphere. Lots of rapid, move your hips Cumbia’s, and Huapango’s which in most part intended to have the crowd forget; unwind and loosen up on what comes with a hard days worth of work and stress. Risueño’s band members consist of Dad (Sabas Lopez Sr) who plays the squeeze box Accordion and (Sabas Lopez Jr) who is the lead singer and stums the 12 string Guitar together with the runt son of the family in the drums (Daryl Lopez) together with fill in precussions. Risueño has recorded 5 music cd’s and has given out 1000’s of cds in concerts and private events over the past 12 yrs. Movie at the Lighthouse this Friday! OLD DOGS 9:30pm FREE! 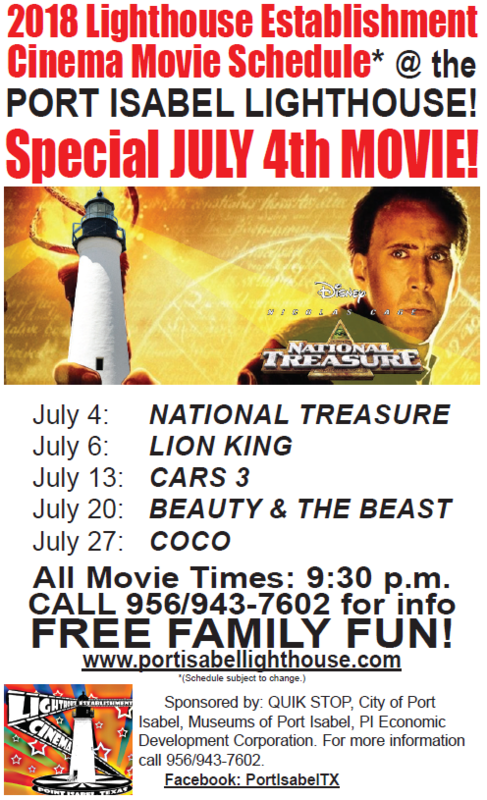 Come join us for the last movie of the summer at the Port Isabel Lighthouse! The Lighthouse Establishment Cinema will present … OLD DOGS. Bring your lawn chairs, blankets or pillows and your family and make yourself at home for this family friendly FREE event! Concessions available. Leashed pets allowed, but you must clean up after them. Parking around the lighthouse and on Railroad Ave. across the street from the Port Isabel Historical Museum. Starts at 9:30 p.m. after South Padre Island Fireworks over the Laguna Madre. Sponsored by: SOUTH PADRE BANK, N.A. (understudy), Pirates Landing Restaurant, Museums of Port Isabel, City of Port Isabel, Port Isabel Economic Development Corporation, Port Isabel Merchants Committee. Movies at the Lighthouse this FRIDAY! Blindside at 9:30 p.m.
Come join us at the Port Isabel Lighthouse for a great summer tradition! The Lighthouse Establishment Cinema will present the third movie of the 6th season… TRANSFORMERS II: REVENGE OF THE FALLEN. Come join us at the Port Isabel Lighthouse for a great summer tradition! The Lighthouse Establishment Cinema will present the thirdmovie of the 6th season… TRANSFORMERS II: REVENGE OF THE FALLEN. The Lighthouse Establishment Cinema will begin Season 6 on June 18, 2010! Six showings are scheduled for the summer and one during Halloween and Day of the Dead weekend on October 29th. The public is invited to bring lawn chairs, blankets, picnics and friends and family for a memorable evening on the grounds of the historic Port Isabel Lighthouse. The 2010 Summer Schedule includes the following dates: June 18th, July 2, July 16, July 30, August 13 and August 27. All movies start on Friday at 9:30 p.m. just after the South Padre Island Fireworks display over the Laguna Madre Bay. Please participate in our MOVIE SURVEY now through June 1st. Sponsored by: SOUTH PADRE BANK, N.A. (understudy), Museums of Port Isabel, City of Port Isabel, Port Isabel Economic Development Corporation.